By now I have read enough positive thinking literature to know that it is a fallacy to believe I will be happy when something I am looking forward to occurs or when I achieve or obtain something I desire. For example, I am setting myself up for disappointment if I tell myself I will be happy when I buy a new lens for my camera. I will be happy when I expand my wardrobe. I will be happy when I lose those last 5 pounds. I will be happy when the weather is warmer. Sure, I might experience a surge of enjoyment in some of these circumstances. I will probably derive at least temporary pleasure from them. But it is unwise and incorrect to believe that we must wait for the perfect circumstance to experience happiness. If we believe the onus is on situation or condition to provide happiness for us, we relieve ourselves of personal responsibility. Paul writes in his letter to the Philippians (4:11-13), "I am not saying this because I am in need, for I have learned to be content whatever the circumstances. I know what it is to be in need, and I know what it is to have plenty. I have learned the secret of being content in any and every situation, whether well fed or hungry, whether living in plenty or in want. I can do all this through him who gives me strength." Paul knew the secret to happiness was not the perfect conditions, but rather the attitude. The perspective that everything we have is a gift of God - and an undeserved one at that - breeds contentment and happiness. It is our decision to wake up each morning thankful for what we have, to be cheerful and charitable in our interactions with others. Despite this head knowledge, practice is quite another thing entirely. Being happy is hard work! And it's always the little things that get to us. I almost find it easier to put on a brave face when the big things go wrong. It's when I'm already 10 minutes late and I can't find a pair of matching socks that my patience goes out the window. It takes discipline and presence of mind to take a deep breath, put on a smile, and go calmly about your task when things are going awry. I'm working on it. I'm getting better at it. Several times a day I need to realign. Shoulders relaxed, jaw unclenched, cleansing breath, smile. Oddly enough, I am finding that other people are delight to be around when I work on being a delight to be around. Here's my challenge to you. Find your personal "I'll be happy when…" statement. We all have one. I do not long for more possessions. I don't think life will suddenly be perfect when I lose the last of the baby weight. Mine is: I'll be happy when I'm not so busy. Boy, do I hate when I feel that commitments, serving others, or social obligations are encroaching on my introvert recharging time. I value time over possession. Experience over things. Thusly, I always imagine that if I have a certain amount of free time, I will suddenly evolve into a zen and joyful being. It is precisely in the busy moments that I must choose a positive attitude. Once you have identified your own peculiar "I'll be happy when…" statement, you can then begin the process of overcoming it. Don't be happy when. 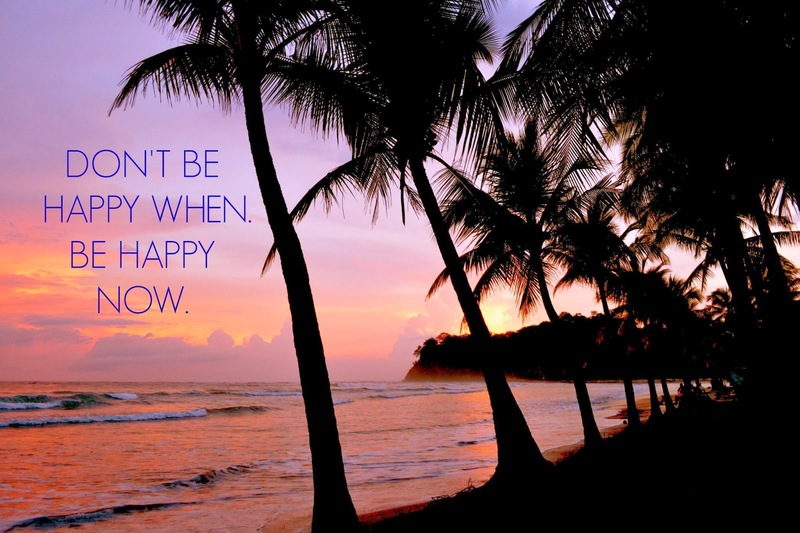 Be happy now - through God who gives you strength.